Many business owners get stuck at times and feel the need to hire a consultant to supposedly turn the situation around. Here is a timeless lesson on how consultants can make a difference for an organization. Last week, we took some friends out to a new restaurant, and noticed that the waiter who took our order carried a spoon in his shirt pocket. It seemed a little strange. 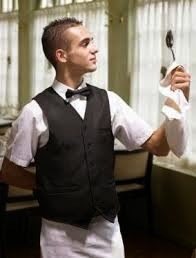 When the busboy brought our water and utensils, I noticed he also had a spoon in his shirt pocket. Then I looked around saw that all the staff had spoons in their pockets. When the waiter came back to serve our soup I asked, "Why the spoon?" "Well," he explained, "the restaurant's owners hired Andersen Consulting to revamp all our processes. After several months of analysis, they concluded that the spoon was the most frequently dropped utensil. It represents a drop frequency of approximately 3 spoons per table per hour. If our personnel are better prepared, we can reduce the number of trips back to the kitchen and save 15 man-hours per shift." As luck would have it, I dropped my spoon and he was able to replace it with his spare. "I'll get another spoon next time I go to the kitchen instead of making an extra trip to get it right now." I was impressed. I also noticed that there was a string hanging out of the waiter's fly. Looking around, I noticed that all the waiters had the same string hanging from their flies. So before he walked off, I asked the waiter, "Excuse me, but can you tell me why you have that string right there?" "Oh, certainly!" Then he lowered his voice. "Not everyone is so observant. That consulting firm I mentioned also found out that we can save time in the restroom. By tying this string to the tip of you know what, we can pull it out without touching it and eliminate the need to wash our hands, shortening the time spent in the restroom by 76.39 percent. I asked "After you get it out, how do you put it back?" "Well," he whispered, "I don't know about the others, but I use the spoon."